Today we read about Ossiri creating her own instrument in Ossiri and the Bala Mengro. We decided we would give this a go as well! We used lots of different recyclable materials from around the school, just like the Tattin Folki in the book do. 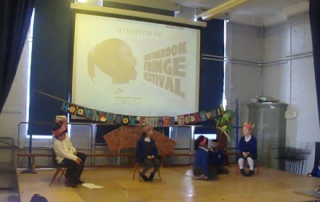 This week Year Two have been learning all about performing plays. We worked with scripts, making them even better than the originals we had been given. We then held auditions to decide who would be best for each role, before practicing our expressions, actions and body positions. of adjectives to describe our costumes. This week Year 2 visited the CLC (Connected Learning Centre) in Clapham Old Town to experience programming and debugging. They taught us all about how to programme Scratch the cat to race a friend. We experimented with different blocks which would allow the characters to move certain speeds or certain directions. This week in Year two we have been learning all about poetry. We have been examining poems from Michael Rosen. We chose to preform Steam Train to the Year 3/4 Owls. We watched videos of Rosen performing his own poems to draw inspiration about what actions, voices and facial expressions we could use. We were fortunate enough to welcome a poet to our school yesterday as part of our whole school Poetry Week. Adisa is an award-winning performance poet who came to work with us all through assemblies and workshops. The children have started to look at music in China. They looked at tempo and dynamics and created music, using drums and cymbals, to accompany their dragon (dance) movement. They definitely enjoyed this lesson – making plenty of noise. vid from Heathbrook on Vimeo. Today we started learning about giving change. We set up our own little shops, where we worked on adding up or shopping and finding the change from a given amount of 50 pence. Hockey lessons in our new pitch! Year 2 will be enjoying hockey lessons in our new all-weather pitch this term! Big thanks to our coach from the Spencer Club.